Long time no see! Sorry it's been so darn long since my last post - moving cross-country has been a bit more time consuming than I thought it would be. No rest for the weary...we were in Colorado visiting family and friends for a week, then in DC for me to work my 2-week annual tour (I'm an Air Force Reservist), and then a weekend in Baltimore with friends, and finally up to Boston as of last Sunday! We won't be in our home until this Friday, but once we get in you'll be hard pressed to not hear a lot more from me. I'm so excited to get in and DECORATE!!! Since I don't have any of my home goods around and I'm in the process of brainstorming on where furniture should go and what colors I want to use, I've been referencing my stockpile of digital photos so I can still make the most of planning during this interim time. Today I stopped by West Elm - I finally have one close to me and I'm super stoked about it. 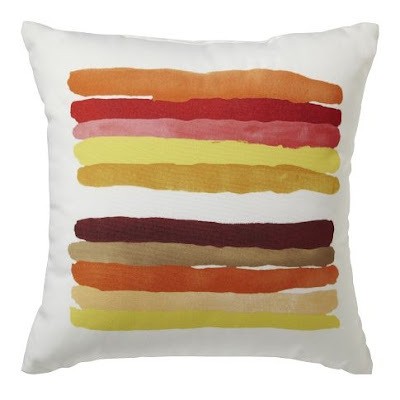 I spent some time time in the sale section and found a great outdoor pillow to add to my living room decor to shush it up a bit. I love that this West Elm Outdoor Sunset Pillow ($20) is made of durable waterproof fabric - a.k.a. stain-resistant (for a 2-year-old) fabric. It's not available online anymore, but they have them in stores still. 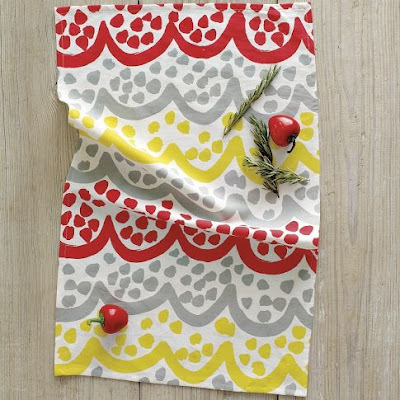 I also found some great tea towels at West Elm, that I plan to make a pillow (or two) out of. A DIY project in the making...so stay tuned. These West Elm Rainbow Tea Towels ($9) have gray, yellow, and a reddish orange - the red is more "orange-y" in person. I think they'll look so cute on my couch (see below). What do you think? Do you like where this decor plan is headed??? I have several more West Elm crushes that I'd like to add to my new space, to include a side table, some curtains, and a lamp. More on that to come - probably in a design board or two.... Thanks for your input as we venture through this redecorating process and thanks for sticking with me despite the few posts over the past few weeks! So fun to see your new space - sounds like you guys have had a busy summer:)! Can't wait to see what you do with those West Elm towels! I like the side table with the armchair and wooden chair, nice contrasting combination.